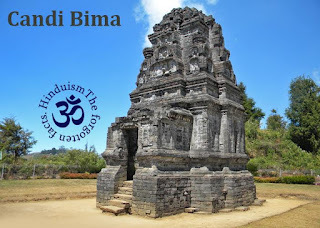 Located in the village of Dieng Kulon, District Batur, Banjarnegara, Central Java, temple is situated in the southern most complex enshrinement Dieng. Large and impressive, C. Bima is located about 1 km south on the road from C. Gatotkaca. The roof, its most remarkable feature, displays numerous sculpted Shiva heads looking out from horseshoe arches. The decoration originates in South India, for example, the Pancha Rathas in Mamallapuram and Galaganatha in Pattadakal. The back of the temple (west side) is shown here; its central kala arch, with garlands dropping from the kala's mouth, is still intact. Just above is a band of swags, below a row of dentals that transitions to the first course of the roof, a simple band of rectangular elements beneath a lotus petal overhang. Above this rests the lowest course of arches, each framing a head of Shiva. The arches are lined with lotus petals. The arches of the second course contain kalasa pots, symbolizing abundance. Above, on the sides, rounded and ribbed amalaka capitals sit upon very short columns. The course above contains one arch with a (now missing) Shiva head, in front of a rectangular facade with lotus petal overhang that imitates the first course of the roof. The projecting central facets are both wider and taller than the facets on the side. This imparts a strong verticality and momentum to the upward thrust of the structure, a tour de force of the builder's art.